One of the things you discover when you first begin a low carb diet is how many everyday foods are loaded with sugar and carbs. Ketchup — a condiment rarely thought of as “sweet” — is loaded with sugar. So is barbeque sauce. Both of these condiments can be hard to part with for low carb dieters. Fortunately, there are still some tasty condiments that you can use on proteins that won’t add any carb count to your meals. Anchor Bar’s Bufdfalo Wing Sauce is one of them. There’s nothing purposely “low carb” about Anchor Bar’s Buffalo Wing sauce — it just is, and always has been. It leverages a list of no-carb ingredients for that original buffalo wing taste, made with only Cayenne pepper, vinegar, salt, garlic, margarine and other secret ingredients. All blended together for a rich, smooth fully prepared sauce. No mixing, no mess, no guess work. It really is a perfect alternative to barbeque sauce on all kinds of chicken dishes. For anyone who loves sweets, snacks, and desserts, there’s a sobering reality that everything that tastes good seems to add far onto our bodies. That’s just the way food works. The inventive folks at Julian Bakery have not gotten that memo, however, as evidenced with their new Zero! Cookies.When you think “zero,” the immediate assumption is that these are zero carb cookies. And you’d be right. But Julian doesn’t stop there — they take their Zero! Cookies to a whole new level of what “zero” actually can mean. In addition to being sugar free, Zero! Cookies are also completely starch free, and made with only premium ingredients. The result is an amazing taste and texture — just like a real cookie — but without the real effects of eating one. These cookies are made fiber and sweeteners that are not at all metabolized by your body — it’s like you never even ate them! Just to give you an idea of how amazing these cookies are, Zero Cookies have less digestible carbohydrate calories in a dozen large 2-ounce cookies than a cup of broccoli and more fiber in one cookie than in 3 cups of broccoli. In fact, there is less digestible sugar in an entire container (10 cookies) of Zero Cookies than in 1 side of an Oreo Cookie without the cream. Amazing! Many times, low carb dieters are afraid to venture back into eat sweets, even if companies claim that their sweets are low carb. If you’re one of these dieters, then you can res assured that their new Zero! Cookies will not ruin the hard work you’ve put into your diet. Thanks for reading our article! Did you know that Linda’s Diet Delites carries a wide range of Julian Bakery products, including Zero! Cookies? Take a look at all the low carb and zero carb products we have to offer. From Wholesome Sweeteners, “Wholesome Sweeteners Fair Trade Certified Organic Molasses is a blackstrap molasses with a rich, full-bodied robust flavor that adds natural color and opulent caramel molasses tones to recipes. It is especially good in molasses cookies, in other baked goods, breads, sauces, BBQ sauces and in marinades. It can be used as a one-for-one replacement for refined blackstrap molasses. Wholesome sweeteners Organic blackstrap Molasses is available online at Linda’s Diet Delites! Take a look! There are plenty of low carb tortillas on the market today. Unfortunately, not many of them make the grade when it comes to taste. Usually there’s a sliding scale: the lower in carbs, the lower the taste. If you want the authentic Mexican flavor and texture of a good tortilla, you’re going to have to be willing to ingest some serious carbage. Tumaro’s Gourmet Tortillas are overturning this paradigm, however, since they manage to craft a really tasty tortilla that is low in net carbs. At just 4 grams of net carbs, you can incorporate one or two of these tortillas into your next Mexican meal — or use one for a wrap — without feeling like you’ve gone overboard. Taste-wise, Tumaro captures that moist, rich texture of a flour tortilla by using oat fiber, whole wheat flour, soy bean flour, wheat gluten, and canola oil to create a really authentic tortilla. Tumaro’s delicious bread replacement products are ideal for wraps, burritos, quesadillas, fajitas, tacos, and enchiladas. Low-in-Carbs tortillas are cholesterol-free, trans fat free, and delicious! 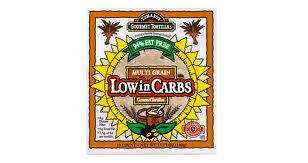 Linda’s Diet Delites carries Tumaro’s Gourmet Low in Carbs Tortillas! Take a look! If you’re like me, then giving up hamburgers and/or hot dogs on a low carb diet can be really tough. Luckily, you can now pair a nice low carb hot dog bun with your hot dogs — and the same for hamburgers. But what if you want to add a little relish to the experience? Unfortunately, most relishes have tons of sugar in them, making them a no-go for a low carb diet. Mt. Olive, on the other hand, has a low carb solution for your relishing of relishes. Mt. Olive is a classic name when it comes to pickles and relish — it’s one of those stalwart brands that you’ve seen your entire life at the grocery store. That’s why Mt. 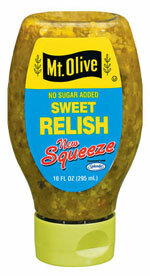 Olive No Sugar Added Sweet Relish is so good — it comes from a truly reliable brand, but without all the sugar. Simply put: one tablespoon of Mt. Olive No Sugar Added Sweet Relish has just 1 gram net carbs. That’s a perfect service for a hot dog or hamburger. Their secret is to use Splenda in place of regular sugar. Because of the complex flavors of relish, the Splenda works splendidly. There is no aftertaste. Looking for Mt. Olive No Sugar Added Sweet Relish? Linda’s Diet Delites has it online! Take a look! 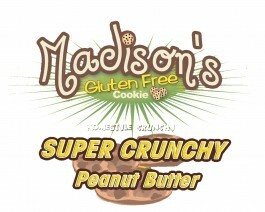 Madison’s Gluten Free Cookies Sugar Free Cookies are the low carb, sugar free, vegan version of the Madison’s Gluten Free Cookies line of cookies. 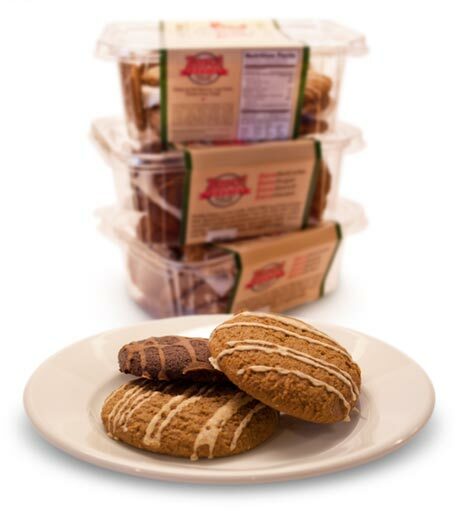 These cookies come in great flavors such as Super Crunchy Peanut Butter, Cinnamon Swirl, and Chocolate Chip Blast. Ingredients: SOY FLOUR(SOY FLOUR, SOY PROTEIN CONCENTRATE), MALTITOL, POLYDEXTROSE, INTERESTERIFIED SOY BEAN OIL, CANOLA OIL, ALL NATURAL PEANUT BUTTER, PEANUTS,LECITHIN, BAKING SODA, NATURAL FLAVORS, SUCRALOSE(SPLENDA BRAND), SALT. Produced in a plant that uses nuts and seeds. Big Train Sugar Free Syrup – Great For Shakes & Drinks! Sugar Free Syrup from Big Train in Hazelnut or Vanilla flavor. Add these to shakes, baking mixes, coffees, or specialty drinks. Ingredients: Water, natural and artificial flavors, cellulose gum, sucralose (Splenda brand), sodium benzoate (preservative), potassium sorbate (preservative, citric acid. Posted on March 17, 2012 March 23, 2012 Categories Sugar FreeLeave a comment on Big Train Sugar Free Syrup – Great For Shakes & Drinks! 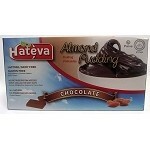 Hateva Sugar Free Almond Pudding in vanilla, caramel, and chocolate flavor are an excellent alternative to high sugar puddings. These shelf stable puddings have been crafted from an almond base and sweetened with xylitol. 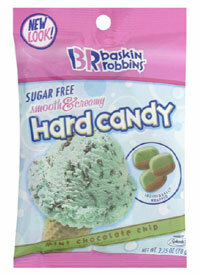 Ingredients: filtered water, xylitol, almonds, starch, modified starch, natural flavors, caramel color, salt. Asher’s Chocolates Sugar Free Chocolate Bars are rich and creamy chocolate bars without the sugar. Ingredients: Maltitol, peanut butter(peanuts, partially hydrogenated palm kernel oil, salt),chocolate liquor, cocoa butter, milk fat, calcium caseinate(milk), contains 1% or less of the following:soya lecithin (an emulsifier), sodium caseinate(milk), sorbitol, natural and artificial vanilla flavor, antioxidant. Sugar free and low carb candy can be hard to find at the local supermarket. Fortunately for you, we’re keeping on the leading edge of the best low carb and sugar free candies. From the supermarket’s perspective, there isn’t much of a local market for sugar free candy — as most people prefer the sugary stuff. But when you add up all of the people in the U.S. who want or need sugar free candy, it adds up to millions of dieters, diabetics, and anti-sugar people. That’s where online stores like ours come in. Chocolate is one of the best bets when it comes to sugar free candy. The rich, underlying bitterness of cocoa helps to counteract any lingering aftertaste, and works well with popular sugar alcohols. 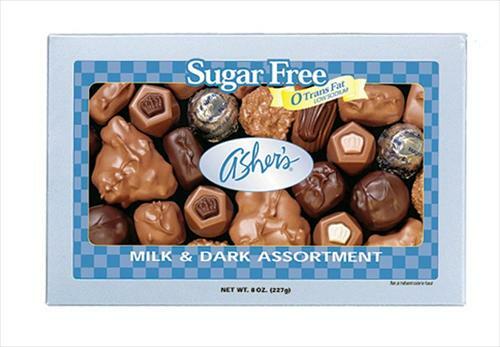 Asher’s Chocolates Sugar Free Candy Bars have taken the use of chocolate in sugar free candies to a new level. At just 1 gram of net carbs per serving, it’s amazing low carb and sugar free dessert for those craving chocolate. But if your idea of a great sugar free candy is something more earthy and less decadent, there are plenty of other choices out there as well. Even granola bars can have tons of refined sugar in them, in addition to the carbs that come with the use of grains, nuts, and dried fruits. 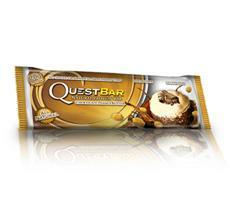 But the Quest Nutrition All Natural Quest Bar offers some great, earthy taste with the nutritionals you’re looking for. The All Natural Quest Bars are different from the standard quest bars in that all ingredients used are all natural and the sweeteners used are only erythritol, lohanguo, and stevia (no sucralose). Best of all, each bar is only 3 grams of net carbs. You can’t beat that! 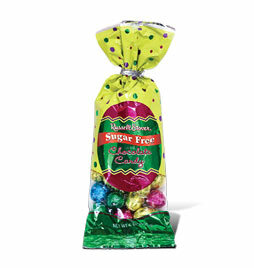 Be sure to take a look at our wide selection of sugar free candy on the Linda’s Diet Delites website. Thanks for reading!